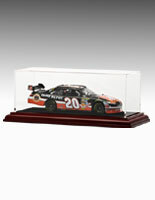 These Memorabilia Display Cases Hold Large Items or Collections! 19" Wide Acrylic Presentation Boxes with Cherry Finish Base Are Stylish! Memorabilia Display Cases are For Sale Online! Common Size (w x h x d): 18" x 10" x 10"
MDF base of the memorabilia display cases emulate finished cherry wood. 1/8" acrylic cover is a much higher quality than the brittle styrene commonly used for plastic showcases. Units are easy to open, featuring a lift off top. 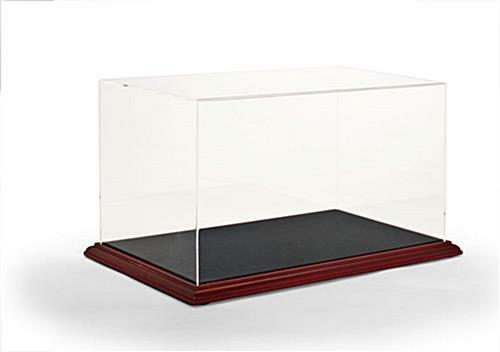 These 11" high sports memorabilia display cases, showcases for collectibles, can hold a wide variety of objects. 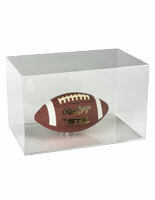 A large size makes these acrylic boxes particularly useful for displaying sports collectibles. A standard size basketball or football can fit with ease into these memorabilia display cases that have a wood base. A selection of autographed baseballs or hockey pucks also present well in the acrylic boxes. Additionally, a football helmet can fit inside the memorabilia display cases that sit on a shelf (check the inside dimensions listed below). 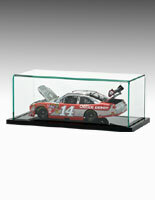 The acrylic boxes for collectibles are not just for sports items, but can also show custom-built models. 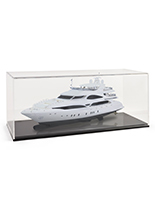 These plexi-glass boxes, memorabilia display cases, are designed to sit on a table or shelf. The crystal clear top protects a basketball from dust, while providing a full view of the collectable. 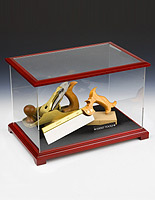 These deluxe memorabilia display cases that have a wood base are relatively heavy, making them less likely to be knocked over. Inexpensive helmet cases offered by the competition are lightweight and break easier than these acrylic models. An important selection of baseball collectibles is not only well protected, but is also enhanced by the wood base and thick plexi-glass top. 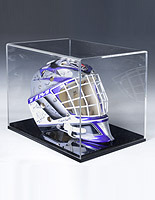 The memorabilia display cases that have a velvet lining provide a matte black surface to ensure visibility of a helmet or other sports equipment. 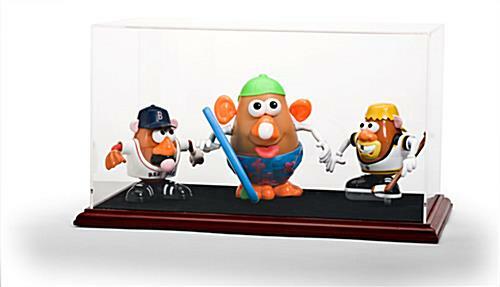 Any football, baseball, hockey puck or basketball placed inside these showcases will capture the interest of viewers. 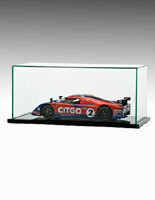 These memorabilia display cases are large and can fit a wide selection of collectibles. Multiples of items are easy to display in this showcase, in addition to a single collectible. 19.7" x 11.0" x 11.8"
17.9" x 10.0" x 10.0"